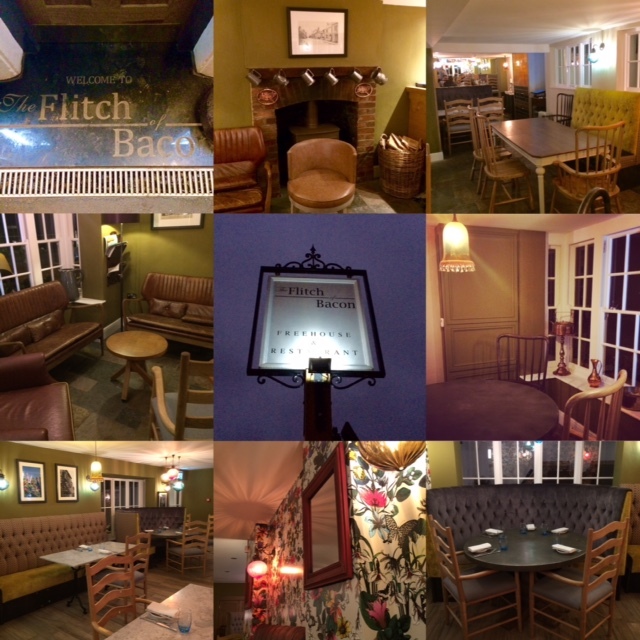 The Flitch of Bacon is located in Little Dunmow, a pretty village in the heart of Essex. I’ve been following its progress for quite a while. 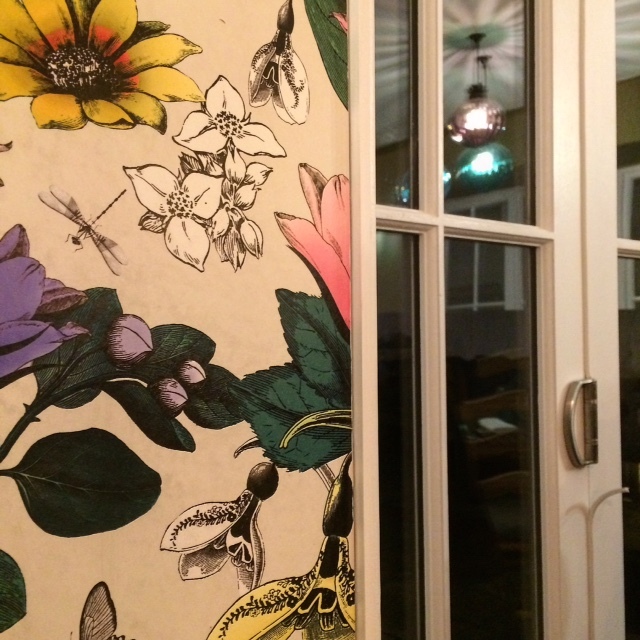 It’s an exciting new venture by Michelin-starred chef Daniel Clifford of Midsummer House in Cambridge. We received a warm welcome and I was pleased to see that it wasn’t a snooty gastropub (but let’s not use that word, shall we?). 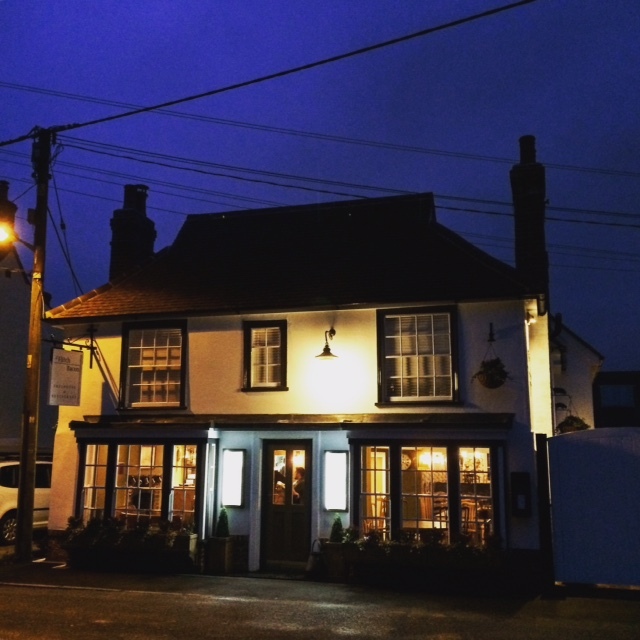 The atmosphere in this beautifully restored pub was friendly and inviting. 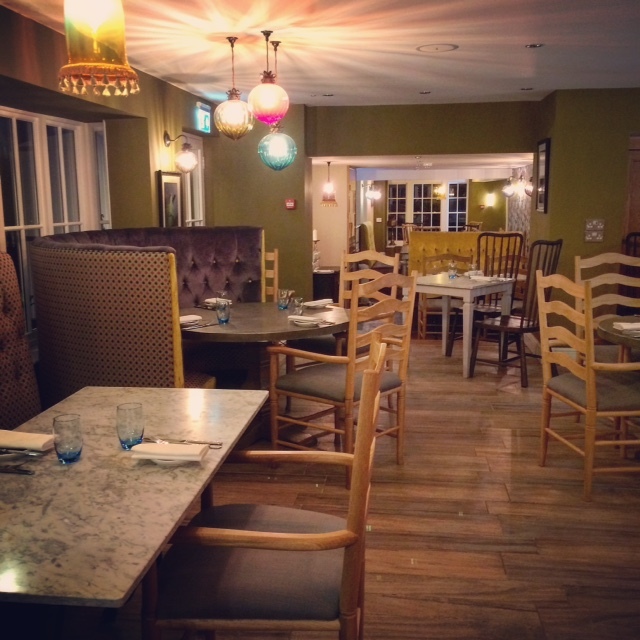 There is even an informal bar at the front with cosy seating by the fireplace. I loved the casual yet stylish décor with a mixture of plush seats and wooden chairs. 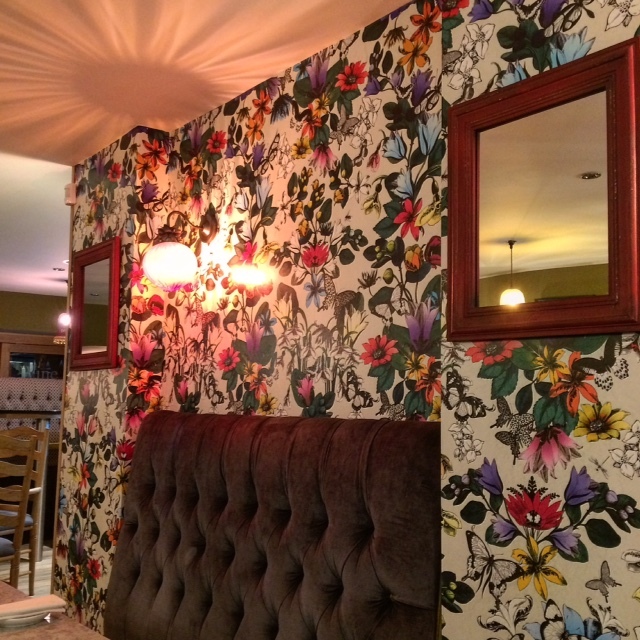 The flowery wallpaper added the perfect contrast and the lighting set a warm and inviting tone to our evening. Service was outstanding from start to finish. 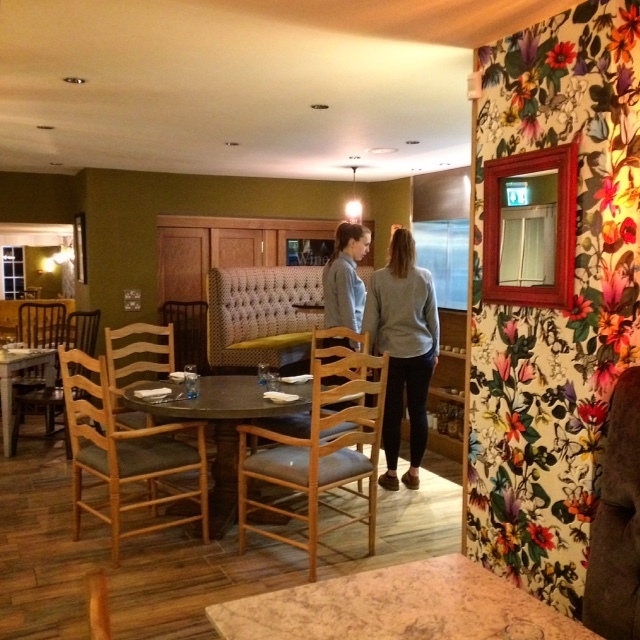 Staff were unobtrusive yet attentive. We felt very at ease and enjoyed the informality. The experience struck the perfect balance between superior food and relaxing ambience. The menu featured classic dishes that are elegant but uncomplicated, focusing on seasonal, local produce of the highest quality. The aromas of each dish were the first thing we noticed. I don’t think I’ve ever experienced this at any other place. Everything we were served hit our sense of smell first. Then there was the taste… each mouthful provided an explosion of fresh, vibrant flavours. The wine list had a nice selection and was reasonably priced. 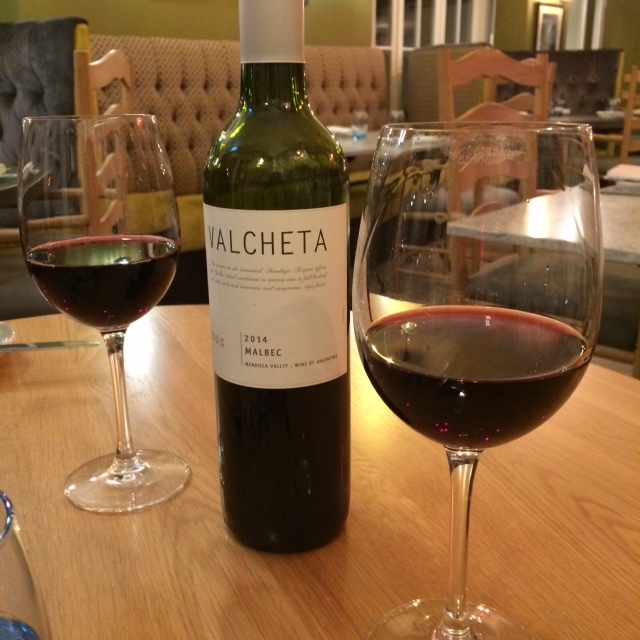 It was divided into tasting preferences and we chose a wine from the big, bold flavours category: a Valcheta Malbec 2014 from Mendoza, Argentina. 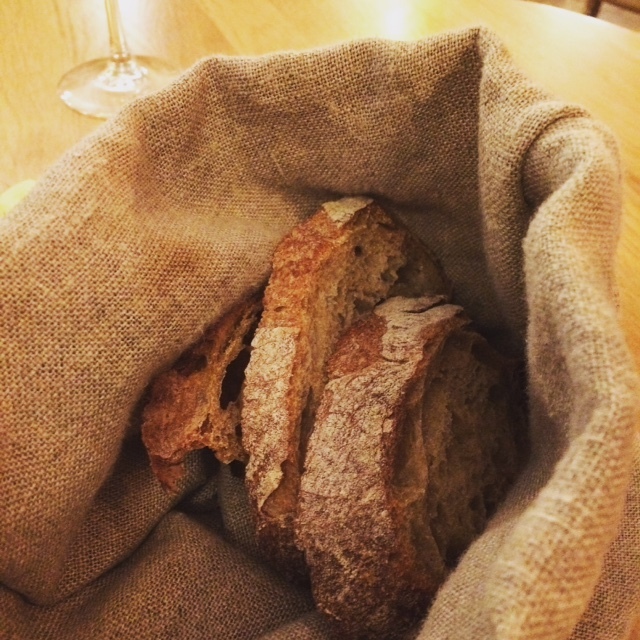 Fresh bread was served in a cotton sack, which lent a wonderful air of informality to our dinner. 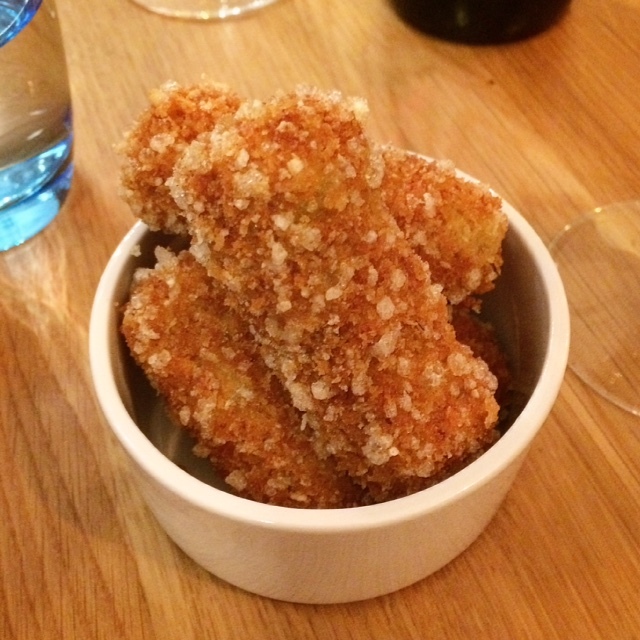 We could also order nibbles while we perused the menu, such as olives, nuts and pork crackling. However, the ham hock & Lincolnshire poacher croquettes were superb: delicious ham and cheese encased in a crispy, slightly salty crust, not the least bit soggy or greasy. 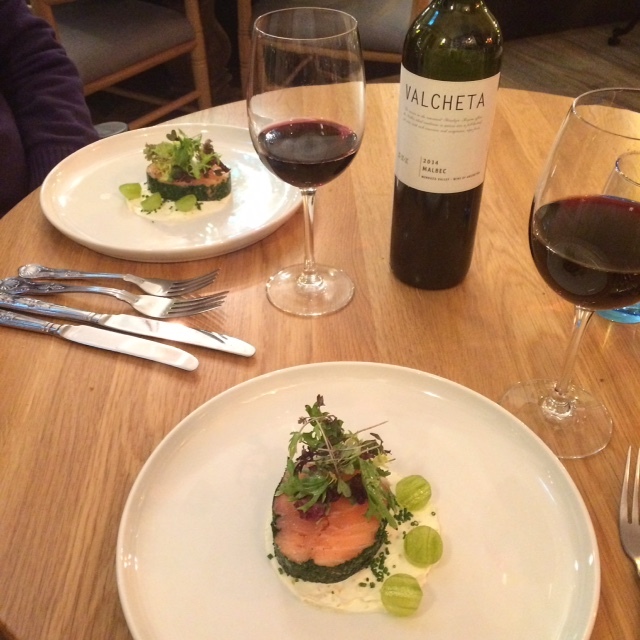 All of the choices for the starters were appetising but Paulo and I chose the same one: ballotine of organic salmon with crème fraiche, chives and cucumber. We both agreed that this was one of the best dishes we’ve ever eaten. The salmon deceived the eye. 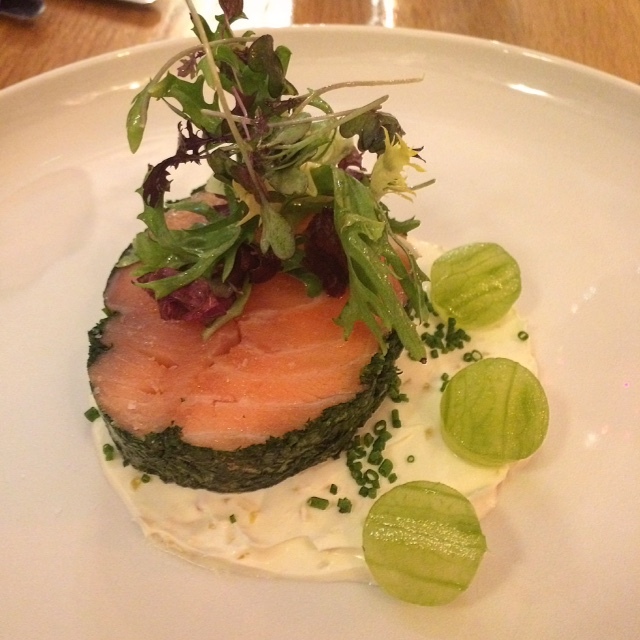 Its texture was soft and the crème fraiche enhanced the fresh taste, with tangy cucumber for contrasting flavour. 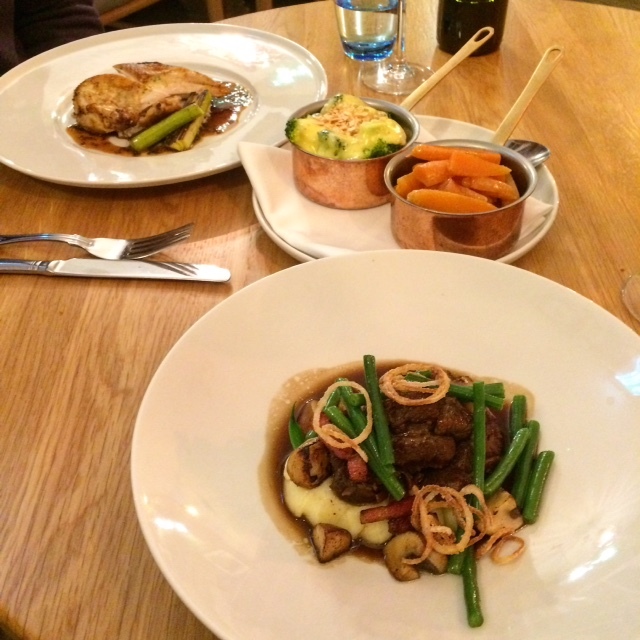 Main dishes featured duck, steak, fish (cod or pollock), pork belly, mushroom risotto, chicken or beef cheeks. 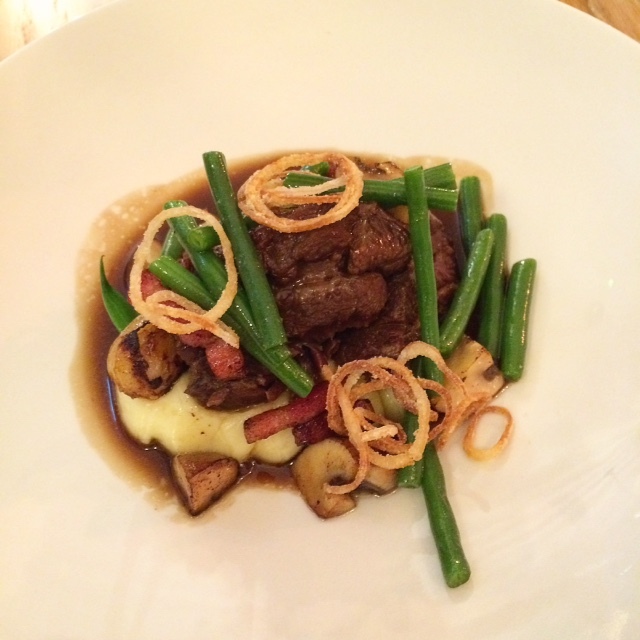 I decided to go out of my comfort zone and try the braised cheek of beef with buttered mash, crispy bacon, mushrooms, green beans and onion rings. The beef cheeks were so velvety, each bite practically melted in my mouth. This was comfort food elevated! 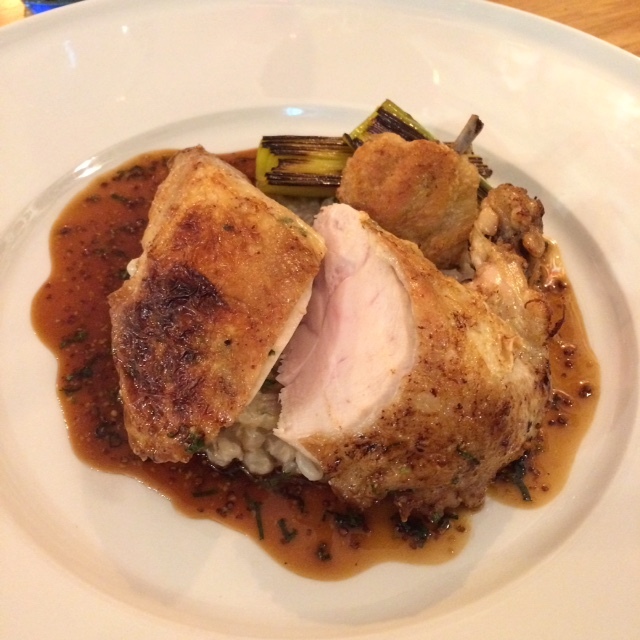 Paulo had the pot roast chicken with creamed pearl barley, charred leeks, grain mustard and tarragon. I had a bite and the chicken was of superior quality. 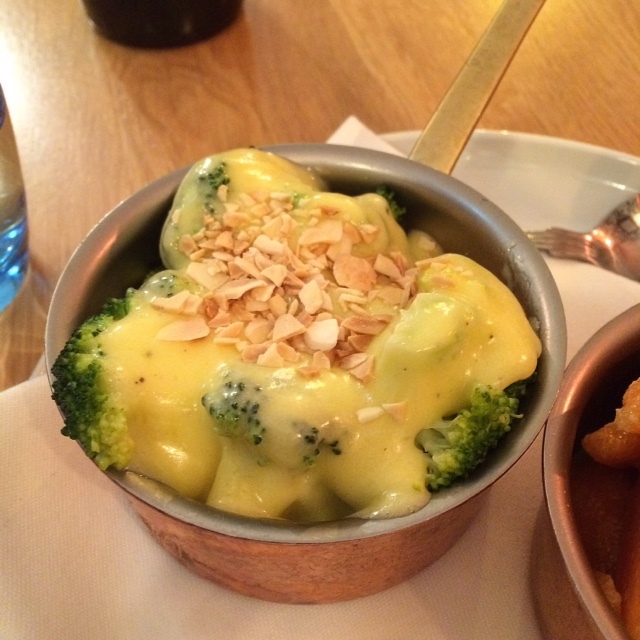 We could order from their selection of sides, such as chips, creamed mash or salad but we went for the glazed carrots and broccoli hollandaise topped with slivered almonds. 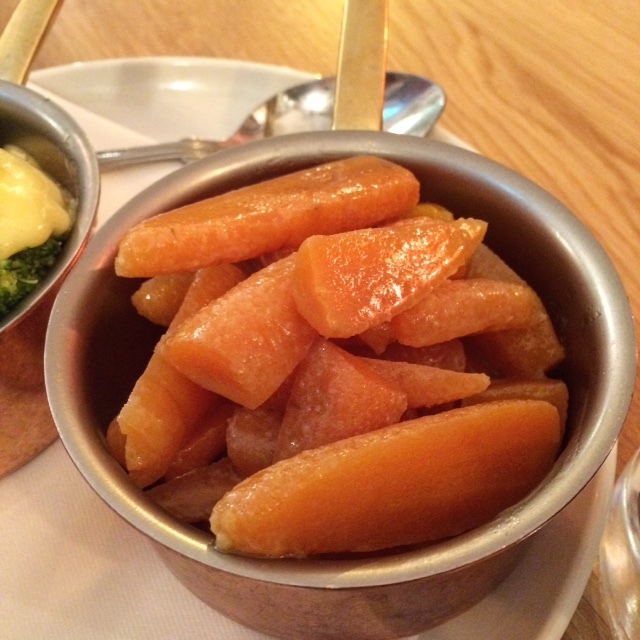 The vegetables were served in little copper pans which helped keep them warm. We barely had room for dessert but the choices were too good to pass up. We were also glad we didn’t give in to our temptation to ask for seconds of their lovely, fresh bread. I had my eye on the blood orange soufflé with dark chocolate sorbet. 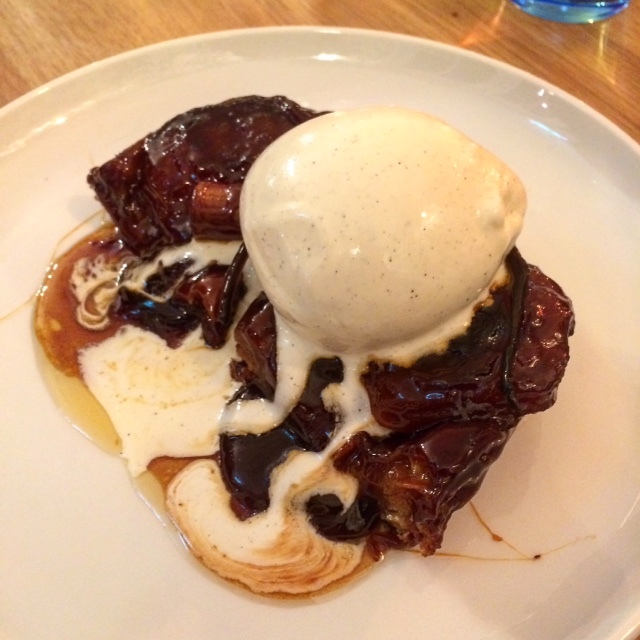 However, the apple tarte tatin was for 2 people, perfect for us. It was sweet and decadent with apple and caramel in golden puff pastry, topped with vanilla ice cream. 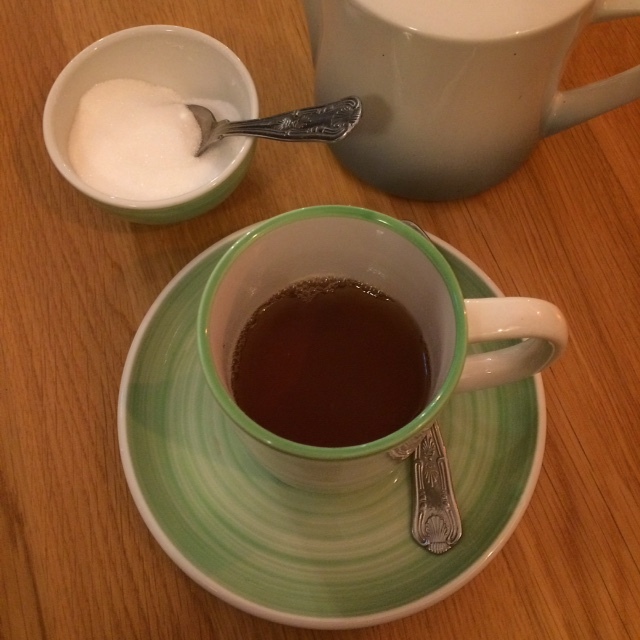 I finished off my meal with tea, Tiptree Earl Grey to be precise. Yes, I’m that person, the one who checks the tea bag label (#sorrynotsorry). Nice Essex connection there and I really enjoyed the tea. 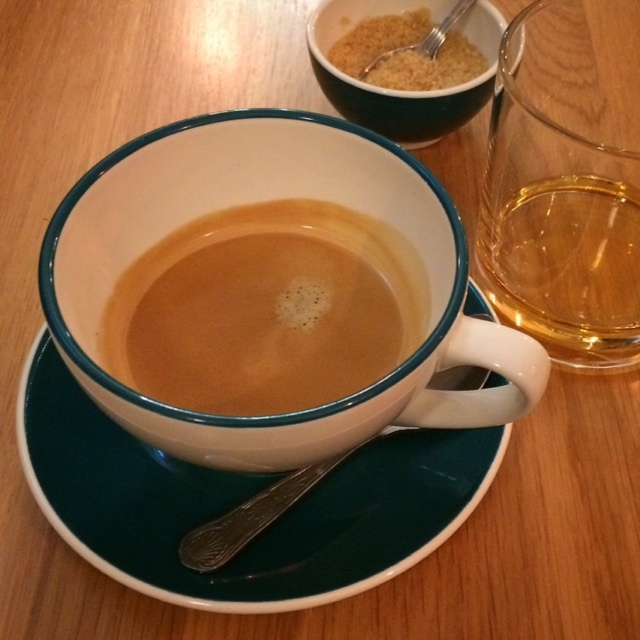 Paulo enjoyed a single malt scotch with his double espresso. He was delighted to have it served in a large cup. We were given complimentary chocolate truffles crusted with crushed hazelnuts. 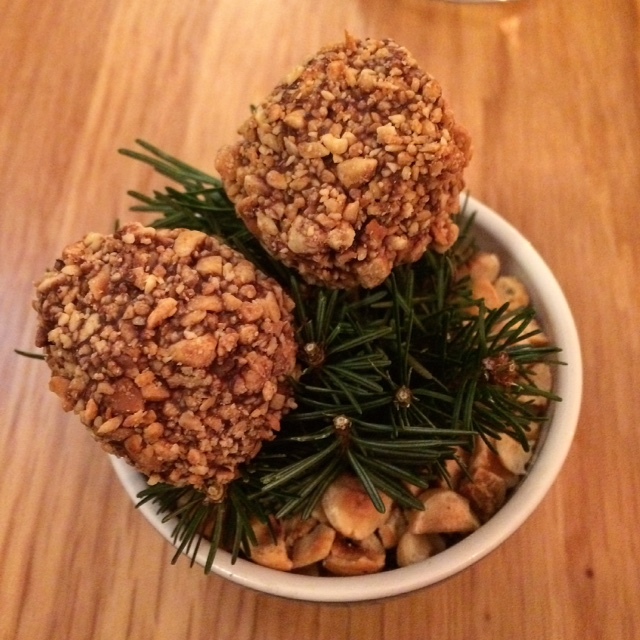 They were served on a bed of impeccable pine needles with more hazelnuts at the bottom of the bowl. It was a memorable way to end our wonderful dining experience. We can’t wait to return to The Flitch of Bacon. Next time I’ll reserve The Kitchen Table, a counter positioned to the left of the pass. It seats two people with a perfect view of all the hard work, skill and creativity taking place in a top kitchen. This entry was posted in Restaurants and tagged apple tarte tatin, beef cheeks, Cambridge, croquettes, Daniel Clifford, Essex, Little Dunmow, Midsummer House, salmon ballotine, The Flitch of Bacon, truffles by One Two Culinary Stew. Bookmark the permalink. That sounds just delightful Pina. On my list of places to try!